Floor Finishes Should Never Be Done On The Cheap. Here's Why! It’s only human nature to want the best but not the price that comes with it. There’s no shame in that, it’s how society works. As consumers, we want the best for less, but when we can’t get the best, we often just settle for whatever less gets us. And while that policy may work fine for a T-shirt or gift for your co-worker, you might not want to cut corners while purchasing new airbags for your car. Much of the same can be said about tiling and floor finishes, as the old adage goes, you get what you pay for. If you want a surface that will look the way it did on the first day for any substantial amount of time, you might have to dig a little deeper than just the surface of your wallet. Because flooring isn’t really an industry where one might pay more, simply because of the label attached to the product, it’s safe to assume that the more you pay, the better the quality. Now, in terms of more bang for your buck, you need to be specific what type of bang you’re looking for. There is an almost perfect correlation between price and quality. However, there are a few reasons why you might pay more for a tile that aren’t specifically related to durability. Appearance is one reason why you might expect to pay more for one tile over another. For instance, polished porcelain will cost you more than the unpolished equivalent due to the added production costs involved. Also, a clearer design will cost more but that’s the price you pay if print quality is priority of yours. Of course, one of the most crucial reasons not to shun the extra bucks spent on quality when it comes to flooring, is longevity. Unless you want to change tiles as often as you change bed sheets (Really counting on you and your hygiene for this analogy to work), you’d be best advised to spend a bit more on quality. In terms of durability, the key measure for tiles is the PEI rating. A higher PEI rating means the tile is more durable and scratch resistant. Of course, higher PEI’s also cost more. This is important for areas with high foot traffic. While you might pay more for better design and style for your laminate flooring, there are factors that increase its longevity that are also worth the extra cost. Medium density fibre might cost less but high definition fibre along with the thickness of the layer above it, would greatly increase the laminates resilience. So while they may appear just as good at the store and that price tag looks so appealing, it’s never a good idea to go too cheap on flooring. I could have attached some pictures of multiple carpets that haven’t stood the test of time or outdoor tiles that got into a fight with the snow and lost. However, after taking into consideration our younger audience probably reading this article right before bedtime, I decided against it. Cheaper tiles will inevitably show their worth, or lack thereof. If you want ceramic tiles that won’t scratch or crack, you’ll have to pay. 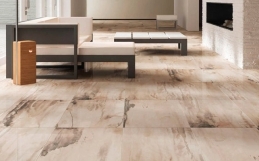 If you want your porcelain tiles to have that air of luxury, then you’ll have to pay. If you want laminate wooden panels that actually stay bonded together, then… well you get the point. And if you were looking for a blog post that was going to advise you on how to save you money, then you’re out of luck. I can however offer you this money saving tip. Next Valentine’s Day, instead of spending money on that expensive date with the girl who’s clearly not that into you anyway, invest in something that will actually be with you for the foreseeable future. Like a wise man once said,” it’s better to have good quality porcelain tiles than to have loved and had to refurbish your entire living room because your cheap tiles are ruined”. It was me. I said that.